There are MANY advantages to having a PayPal account! Safer shopping! Your payment info is never even shown to the shopkeeper. Plus, PayPal protects you against fraud or non-delivery. More payment options! 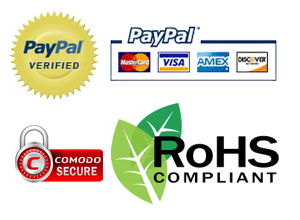 All major credit cards are accepted, but so are debit cards and any existing PayPal balance you may have. A shop my size couldn't possibly offer all these choices without PayPal. Pay in your home currency! *The Hungarian Forint was removed on May 7, 2015 due to processing errors at PayPal. Given how infrequently this currency is used at our store, I removed it rather than waiting for them to fix. If you wish to use this currency, please let me know. Please note that we must charge a small premium to cover actual currency exchange fees. All prices are based in US dollars and currency exchange fees are included when you view the prices in a different currency. Our website automatically takes a best guess at your location and pre-selects your "home" currency for you when you first arrive. Of course, you can change the currency to your liking. If you are logged in, the system will remember your choice later. If payment by PayPal does not suit your needs, please contact me... I'm open to creative solutions. I've had customers pay indirectly with Amazon gift cards, for example. Sending a good old fashioned check is still possible too.